Who is responsible for refugees? Migration has been occurring throughout human history, since early humans left eastern Africa for Arabia and the rest of the world about 60,000 years ago. People have always been seeking to improve their lives or to escape war, oppression, famine and other threats to their well-being by moving. In recent decades, however, migration has been dramatically increasing. In 2013, the number of international migrants worldwide reached 232 million, up from 154 million in 1990 and from 76 million in 1960. Many modern migrants are fleeing war and conflict in places like Syria, Iraq, South Sudan, Central African Republic and elsewhere. In 2015 the U.N. High Commissioner for Refugees reported that the number of people displaced by war, intrastate strife and human rights violations had reached 59.5 million in 2014, 8.3 million more than a year earlier. This was the highest number of displaced persons ever recorded. The number of deaths from conflict and disasters also remains distressingly high. In the eastern part of the Democratic Republic of Congo alone, from 2005 to 2015 over five million persons died due to conflict, chiefly from disease and malnutrition brought about by the fighting. Sadly the protection of people from severe threats to their humanity remains a distant goal. A refugee is a specific kind of migrant. The 1951 United Nations’ Refugee Convention defines a refugee as a person who, “owing to well-founded fear of being persecuted for reasons of race, religion, nationality, membership of a particular social group or political opinion, is outside the country of his nationality.” Refugees have little or no choice about their movement. Because of the persecution they face, their most basic human rights are on the line. The phrase “forced migrants” has recently been coined to take into account the fact that religious, ethnic or social persecution is not the only coercive pressure that drives people from their homes. They can be forced from home yet still remain in their own country as “internally displaced persons.” And people escaping extreme poverty may have a moral claim for admission to another country as urgent as a refugee’s claim for asylum. What can we say about our responsibilities in the face of this suffering? As the number of refugees seeking asylum from grave threats has risen, secular political philosophers, like Joseph Carens of the University of Toronto, and refugee scholars, like Philip Marfleet of the University of East London in the United Kingdom, have argued that the time has come to consider making borders fully open to migration and to granting asylum to all people who are fleeing from persecution, conflict or disaster. In a similar spirit, several years ago Martha Nussbaum, a University of Chicago philosopher, argued that the cosmopolitan community of all human beings has primacy over narrower communities defined in terms of nationality, ethnicity or religion. Indeed she called nationality a “morally irrelevant” characteristic of personhood. This support for open borders can be given Christian religious backing. Christopher Hale, executive director of Catholics in Alliance for the Common Good and a Catholic cultural commentator for Time magazine, affirms that “in Jesus Christ, there are no borders.” This stance has biblical roots. In the Gospel of Matthew, for example, just after Jesus’ birth he was driven from home with Mary and Joseph by King Herod’s effort to destroy him as a threat to his regime. Anachronistically, we could say that since Jesus was fleeing persecution across a border, he met the contemporary international convention’s definition of a refugee. Also in Matthew’s Gospel, Jesus teaches that on the Day of Judgment one’s salvation or damnation will be determined by whether one has welcomed the hungry, the thirsty and, most relevant here, the stranger (Mt 25:40). Thus Christians should recognize their special duties to suffering people who are not members of their own communities, including migrants and refugees. The question, of course, is whether this philosophical and Christian universalism means that state borders have no moral relevance. In fact, the issue is more complex. An appreciation of the common humanity of all people must not only support the unity of the human family but must also respect the differences among peoples, cultures and nations. An exclusive stress on what we have in common will have difficulty explaining why being forced from home, either as a refugee or within one’s own country, has such negative moral significance. We need, therefore, a more differentiated approach to how responsibilities reach across borders than the stress on the unity of the human family, taken alone, can provide. In her recent writings Professor Nussbaum now draws on Grotius and Kant to argue that people exercise their freedom and express their dignity when they join together to shape the institutions of their own nation state. Protecting the independence of accountable states is thus a way of protecting human dignity. In a similar way, though Christianity requires universal respect for all persons, it also requires respect for their distinctive identities. St. Augustine and St. Thomas Aquinas both affirm a Christian duty to love all humans as our neighbors. At the same time, they recognize that there is an order of priorities among our loves (an ordo amoris). Those with whom we have special relationships, like our family or our fellow citizens, deserve distinctive forms of treatment as an expression of our love for them. Christian love therefore requires both universal respect for all and distinctive concern for those with whom we have special relationships. Christian ethics affirms that one has special duties to one’s co-citizens, just as one does to one’s siblings and friends. At the same time, Christian ethics forbids actions and policies that in effect treat those of other countries who are in grave need as nonpersons. The mass movement of people in our world today calls us to reflect carefully on the relative weights of the obligations and rights that arise from our common humanity and from our distinctive identities. Let me suggest several priorities among these duties and rights. We should begin by reaffirming the United Nations’ 1951 Refugee Convention’s affirmation that refugees fleeing persecution should have a high-priority claim to be granted asylum in another country. 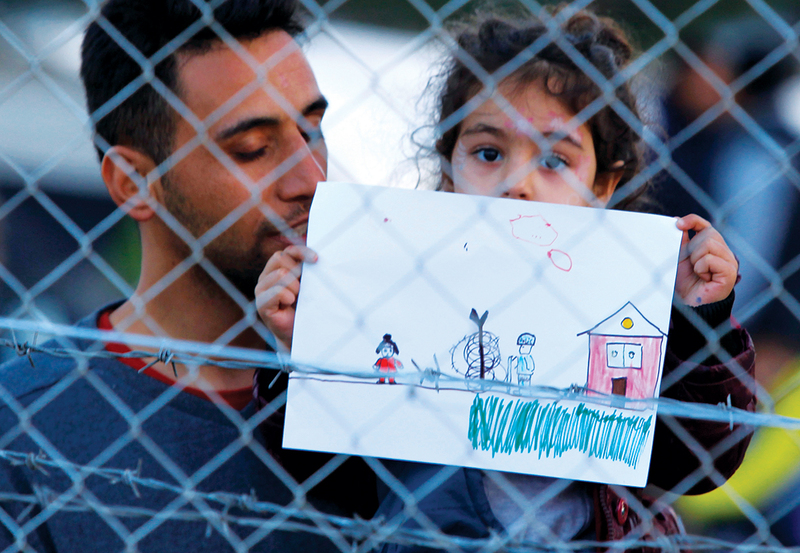 Refugees are people who have virtually no alternative except flight from home. In almost all cases their choice is either migration or loss of basic human rights, in many cases even the right to life. Thus in all cases where a country has the resources to admit refugees without severely jeopardizing the life and well-being of its own citizens, it ought to do so, granting asylum to the refugees at its borders. In addition, we should insist with the Refugee Convention that refugees have a right not to be subject to forcible return (refoulement) to regions where they face serious threats to their lives and freedoms. The priority of non-refoulement of refugees is grounded both in Christian respect for the dignity of every person and in the wisdom formed by political experience. It is clear that wealthy countries like those of Europe and North America have the resources needed to grant asylum to refugees from countries like Syria and South Sudan today. Chancellor Angela Merkel took the right path when she decided to relax Germany’s borders to all those fleeing the chaos of Syria. When Prime Minister David Cameron of the United Kingdom announced that his country would grant asylum to 20,000 people over the next five years, however, he was appropriately reminded that Lebanon had admitted that many Syrians over the previous two weekends. Indeed, developing countries today host 86 percent of the world’s refugees, the highest percentage in more than two decades, and the very poorest countries among them are providing asylum to 25 percent of the global total. Thus the rich nations of the North have a duty to admit a considerably larger number of asylum seekers than they do now and an even greater duty to assist these less-developed countries that are already hosting most of the world’s refugees. Sadly, the funds being provided for this burden-sharing by the North fall far short of what is needed. It is also clear that in wealthy nations like those of the United States, Europe and Australia, much of the negative attitude toward migrants and refugees is grounded in a mixture of racially driven xenophobia and a mistaken fear that refugees may be terrorists. Dislike of the needy stranger, especially when motivated by racial or religious stereotypes, is clearly contrary to core principles of Christianity and to the secular norms of a human rights ethic as well. The asylum needed by refugees should be a top priority as we determine how to combine loyalty to our own community and to those from other societies. Balancing these loyalties requires that we work to overcome exclusionary, xenophobic attitudes. A further priority arises from the special duty a rich country that has contributed to the economic deprivation of a poor country can have toward migrants from that country, especially if they are fleeing the dangers of war. For example, European powers that benefited from colonizing regions of Africa or Asia without contributing to their development have significant duties to be open to refugees and other migrants from these regions. Thus France and the United Kingdom have duties to migrants from their former colonies that they probably do not have to migrants in general. Economic benefit through forms of exploitation other than formal colonization can create similar duties. For example, the political and economic history of the United States in nations like Guatemala and Haiti creates special duties to admit people from those countries, especially refugees fleeing political persecution. A country with a history of military involvement in the life of another country may also have special obligations. The United States recognized its special duty to receive refugees from Vietnam following the end of the Vietnam War in 1975. And though U.S. military engagement in Iraq was not the sole cause of the displacement of many Iraqis, the U.S. intervention was the occasion of the huge forced migration of Iraqis that followed. As the Harvard political scientist Stephen Walt commented in the aftermath of the terror attacks in Paris on Nov. 13, if the United States and its allies had not invaded Iraq in 2003, there would almost certainly be no Islamic State today. Thus the United States and its allies in Iraq have especially strong duties to admit refugees seeking asylum from Iraq and Syria, as well as others fleeing the economic deprivation caused by war in the region. They also have serious responsibilities to help rebuild the political and economic life whose destruction has been the source of the huge movement of Iraqi and Syrian people. There are no doubt additional grounds for a country to grant priority to the admission of migrants from a particular background when not all can be received. These suggestions indicate the direction we should be moving today. Indeed, the most fundamental criterion for determining our priorities should be our duty to support the basic human dignity of those whose lives and basic human rights are severely threatened. As Pope Francis has repeatedly stressed, duties to refugees are duties to our brothers and sisters in the human family and, we Christians believe, duties to Christ. We are urgently challenged to live up to these duties. Yes, people have been moving around the planet for thousands of years. The current situation in the Middle East is a horror. Furthermore---the refugee flow into Europe, Canada and America offers the terrorists a certain method of infiltrating and causing death, destruction and havoc. We should cooperate with the Russians, Turks, Saudis, Jordanians and the UN to set up a good quality safe zone in the Middle East--with a "no-fly" zone---for safety. Bringing tens of thousands to the West insures multiple generations of poverty, dislocation and soul-crushing government dependence. This is DIFFERENT from other historical migrations and there is little chance of healthy integration over a few generations. We should support the Middle Eastern refugees by helping them survive and thrive in their home lands. It is NOT true charity to do what makes us feel good---when there are better alternatives for those whom we would serve. Tom, what do you suggest, in real world practical terms, can be done to set up a "good quality safe zone" fo rmiddle east refugees? Where would it be? Would you create a new country, taking land from exisitng countries (as the UN did to create Israel, with long-lasting problems)? How can we help them "survive and thrive" in their homelands? Most middle east refugees would much prefer to stay in their homelands rather than give up everything to move and live in refugee camps. The reason they are refugees is that their homelands are extremely dangerous, where war is totally destroying the economic base as well as infrastructure, and where their lives of thousands and thousands of people are at high risk. Most refugees and immigrants to the US were rejected when they first came, including most Catholic refugees/immigrants from Ireland, Italy, Poland and elsewhere in Europe. Yet eventually they integrated into American society. For most, it took a generation or two to become economically comfortable, but eventually they did. Why are the middle east refugees different? Sandi, Thanks for your questions. Yes, most of us are descendant from refugees. Most wanted to come---for a better life. They learned the language and culture, served and thrived. Many current refugees---especially those from the Middle East are being run out of their native countries by terrorists---a situation which the current Administration has failed to deal with. Furthermore---America has rejected the "melting pot" model---which suggested integrating into America's culture while retaining love and respect for the "native" land and culture. This is also facilitated by political elements that benefit from this dis-integration. It struck me years ago--that there is much movement and disintegration around the planet---much of it causing multiple generations of pain. Where to find safe zones? How about Saudi Arabia---Muslim, extremely wealthy, language-climate and culture appropriate and--very capable of providing security and good quality facilities---again, supported by Turkey, Jordan, Russia the U.S. and more. The focus is to provide TEMPORARY facilities until people can be returned to their native lands. This is not easy---but it is probably the best alternative for the people involved. The people "responsible" are the radical Islamic Terrorists and they will not stop displacing people until they have displaced or killed all who disagree with them----no matter where they are located. I find the splitting of hairs regarding an "ordo amoris" just a little bit too much, a very scholastic way of looking at a big and serious moral issue. What disturbs me the most in the current swirl of debate and controversy about refugees - Mexican, Muslim, whomever - is the guarded rhetoric of religious institutions in the nation. Few if any of the major religious institutions of the nation have consistently and outspokenly condemned the language and attitudes being daily expressed. One would think, based on polls and news stories, that evangelicals in the Midwest actually approve of the discriminatory comments that they hear. I hear nothing in the pulpit of my own Catholic parish, for example, that explicitly calls out as gravely sinful the xenophobia and racism and jingoism heard on daily news broadcasts. Or isn't it gravely sinful? Even Father Hollenbach tries to persuade with gentle reasoning, a little bit too much gentle reasoning for my taste. While I find the "hell and damnation" route of religious instruction fruitless, and while I do think there are better ways of instruction and formation of moral attitudes, I do expect from our religious leaders some explicit pronouncements that define morality. That seems to me all lacking in the current refugee debates in the USA. An aspect that was not mentioned is the responsibility of the refugees to follow the laws and (as practical) the customs of the hosts to minimize conflicts. While accommodations are not ideal, the objective is to provide a safe place to live and adequate food; in general they are better than the accommodations that were historically for military conscripts in many western countries. Destructive and criminal activities of (probably bored and frustrated) refugees has created a lot of animosity in the host countries. This article also appeared in print, under the headline "The Rights of Refugees," in the January 4-11, 2016 issue. David Hollenbach, S.J., is the director of the Center for Human Rights and International Justice at Boston College. This article was adapted from his presentation upon receiving the Civitas Dei medal at Villanova University on Nov. 18, 2015.